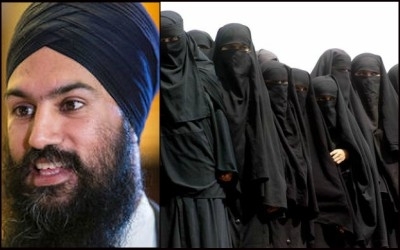 Jagmeet Singh, an Ontario-based Sikh running to lead Canada's New Democratic Party (NDP), believes that opponents of the niqab face mask contribute to "Islamophobia." Federal NDP leadership contender Jagmeet Singh may never have heard of Dr. Nawal El Saadawi, an Egyptian author and the country's leading women's rights activist. Had Singh read El Saadawi or any other progressive Muslim women among the world's one billion Muslims - like Britain's Yasmin Ali-Bhai Brown or Pakistan's UN Rapporteur on Human Rights, Asma Jahangir - he would perhaps not have made the absurd claim that defending the niqab was, as he told the Toronto Star, showing "solidarity with Muslim Canadians who may feel targeted by legislation on religious clothing." A fortnight before Singh defended the niqab as a human right of Muslim women, Egypt's Nawal El Saadawi told a conference in Tangiers, Morocco, that far from being a human right, the niqab is just another form of tyranny. Speaking about male guardianship, El Saadawi said, women fear divorce if they didn't follow the commands of their husbands, but in fact, "divorce will set you free." Calling for a change in the education of girls, she said: "There can be no tyrannical husband anywhere in the world, unless his wife enables his tyranny." Singh should listen to progressive Muslim women, not anti-Western Islamists. Deligöz, who was born in Turkey but grew up in Germany, again addressed Muslim women on this issue in a recent newspaper article, saying: "Wake up to today's Germany. This is where you live, so take off your veils." Also in 2006, in Sweden, the country's minister of integration, Nyamko Sabuni, a Muslim immigrant from Burundi, called for a ban on the niqab for girls under 15 (the Swedish age of consent). Since then, the Islamists and their non-Muslim allies on the left have banded together to silence Muslim women and position their rights as secondary to so-called "community rights." It's the orthodox and ultra-right wing conservative religious clergy, seeped in medievalism, who nonetheless receive political cover from their allies on the vote-hungry Left. 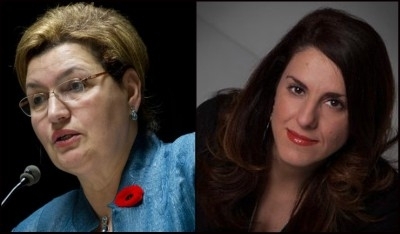 I suggest Singh talk to Quebec Muslim politician and former speaker Fatima Houda-Pepin, or author Djemila Benhabib. They may not be able to guarantee the Muslim vote bank in Ontario, but they will share the truth that covering a woman's head or face is not a requirement of the Qur'an. Or perhaps Singh will listen to a fellow Sikh, Indian journalist Tavleen Singh, who once wrote: "There is a bizarre camaraderie between Godless Marxists and violently religious Islamists. ... It is time for the rest of us to speak up. Time to say loudly: not in my country, not in my name. India is not an Islamic Republic and hopefully will never be, so anyone enforcing half-understood Sharia laws should be sent straight to jail."